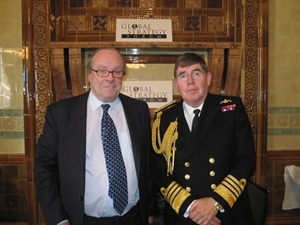 Admiral Sir Mark Stanhope, the First Sea Lord and Head of the Royal Navy, delivered GSF’s June lecture, ‘Delivering Security In An Age of Austerity, on Tuesday 19th June. In his lecture, Admiral Stanhope described how global austerity is driving radical re-thinking as to how nations deliver security and defence in the future and explained why maritime power, which he considered a‘compelling expression of this country’s influence’, provides part of the answer. He said that navies needed to be ‘at sea and at readiness’,with the capabilities to respond swiftly across the ‘spectrum of uncertainty’. In an age of austerity, working more closely with other nations remained ‘paramount’ and Collective Defence was ‘crucial’, as was introducing ‘greater flexibility in our thinking. Thinking that will truly galvanise government, the military, NGOs and business. Thinking smarter to deliver a more networked and more nuanced response in our future security environment‘. He concluded by saying that maximising the utility and employment of our forces – especially in terms of ‘upstream prevention’ – offered a real opportunity to be smarter. To read the full text of the First Sea Lord’s lecture, please click here.